An operative of the Nigeria Customs Service, NCS, Ogun State Area Command, Muhammed Maigari, has been brutally cut with a machete by armed smugglers at Ibeji River around Idogo-Ifoyintedo axis in Ipokia Local Government Area of the state. The command public relations officer, Abdullahi Maiwada, who confirmed this to journalists on Friday, said the victim is currently in a critical condition. He said the incident occurred on Wednesday. He said Mr. Maigari, who is attached to the Federal Operations Unit but posted to the Idiroko border axis, was ”dealt a life- threatening cut on his left upper arm by the smugglers. The spokesman added that the smugglers attempted to disarm Mr. Maigara but when they were unsuccessful, they ”decided to smash his head with the machete but he blocked it with his arm. “It (seized car) is currently in the command’s custody at sentry, Idiroko border. The command will not relent in curbing smuggling activities around Idiroko border and Ogun state as a whole,” he said. 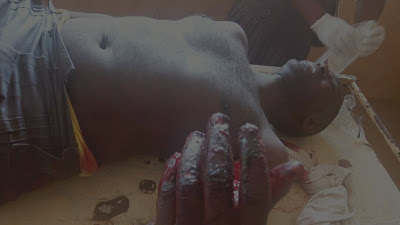 0 Response to "Smugglers Machete A Nigerian Customs Operatives"